Almost half of the estimated 60,000 new cases of melanoma projected this year will occur in the 10 states listed below, according to the American Cancer Society. States at higher latitudes, which have less sun exposure and cooler temperatures, have the lowest projected incidence of the deadly skin cancer. These states include Alaska, Wyoming, North Dakota, Vermont, South Dakota, Delaware and Montana. There is a simple explanation for Hawaii's absence from the high-incidence list. "While it's a hot tropical climate, it's likely that Hawaii's melanoma incidence is low because the state has a large percentage of Asian Americans (58 percent), who have a relatively high amount of the sun-protective pigment melanin in their skin," said Steven Wang, a member of the Skin Cancer Foundation's Photobiology Committee and Director of Dermatologic Surgery at Memorial Sloan Kettering in New Jersey. Greater awareness of the need for sun protection also helps lower the risk. Risk factors include light skin color, family and/or personal history of skin cancer, presence of atypical moles and freckles, and history of severe sunburn early in life. » Seek the shade, especially between 10 a.m. and 4 p.m.
» Avoid tanning and UV tanning booths. » Use a sunscreen with an SPF of 15 or higher every day. » Apply 1 ounce (2 tablespoons) of sunscreen to all exposed areas 30 minutes before going outside. Reapply every two hours or immediately after swimming or excessive sweating. » Cover up with clothing, including a broad-brimmed hat and UV-blocking sunglasses. » Keep newborns out of the sun. Babies older than 6 months should wear sunscreen. » Self-examine skin for changes every month. » See your physician every year for a skin exam. For more information, check www.skincancer.org, or call (800) SKIN-490. This month, Xcel Wetsuits, a Hawaii-based manufacturer of Lycra apparel and wetsuits, will donate a portion of net retail sales of Lycra UV-protection apparel for men, women and children to the Cancer Research Center of Hawai'i in honor of Skin Cancer Detection and Prevention Month. The company also is offering a 10 percent discount on all Lycra UV-protection apparel through Sunday, in celebration of Lei Day, and during Memorial Day weekend, May 25 to 28. Xcel Lycra UV-protection tops are available in four style: sleeveless, short sleeve, three-quarter sleeve and long sleeve, in both solid and floral designs. Prices start at $20 for children, $24 for men and $27 for women. 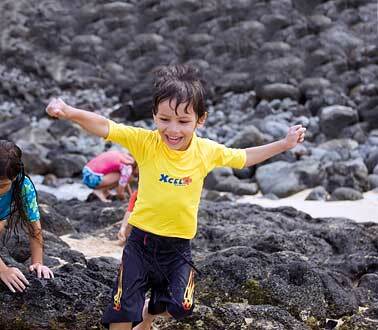 Xcel Oahu stores are at Ward Centre and in Haleiwa at 66-590 Kamehameha Highway. The Cancer Research Center of Hawai'i, part of the University of Hawai'i at Manoa, focuses on the causes of cancer and possible reasons for different cancer rates among Hawaii's ethnic groups; reducing cancer in the Hawaiian population; and discovering anti-cancer agents from local plants and marine microorganisms. The center also conducts educational activities and community outreach. Visit www.crch.org.